Thank you very much for your exciting post. I appreciate enthusiasms and stimulations resulting from the interaction between people of different specialities. I read your paper with great interest – congratulation on your achievements! I have started learning the bobbin-lace quite lately, so my experiences in both weaving and drafting designs are very much limited, only in Torchon and Binche type laces. It is possible I may misunderstand parts in your paper simply by my lack of knowledge. Also, none of the referenced articles are unfortunately not in my immediate reach. So please take them into account upon reading my comments. 1) I like your idea of the directed graph. I’ve been looking for an easy way to visualize the flow of thread on a given design diagram, but never thought of it this way – very smart! 2) In authentic(?) drafting, I understand that dots composing the “grid” usually represents” where you place pins, thus approximating outlines of the intended objects. This contrasts with your directed graph where dots represent all of the locations of stitches. So in the beginning, this difference made a psychological barrier for me and I was a little confused to catch-up, trying to adjust my brain to your new approach. Once I became familiar with it, it was no longer a big problem. Perhaps that’s the important part, too – to know a new way of looking at things. 3) I tend to compare your work with antique Binche laces, simply because this is the type of design I am most fascinated at present. In terms of the assumed limitations you listed up as a basis for your approach, I seem to find some difference in antique Binche. (Though you might have accounted these as in exceptions.) Basically they exhibit a larger freedom in the form of grid – grid with different spacing and angles are apparently mixed up and arranged irregularly, even though they are integrated as a design. This character is obvious if you look at prickings for antique Binche laces. And in fact, this apparent freedom is the very reason that I am so fascinated in them. If you are away from the limitation of monotonously structured grid and allow freedom yourself, there is a risk that you easily get lost because you don’t know how to set up the logic to hold on. I’m sure there are logics in drafting that I’m simply not aware of, but anyway I appreciate that you provide a good example of a system that allows more freedom in designs. 4) I plan to use my handmade gold yarns in future (my real speciality is goldsmithing, by the way), and I guess in case of metal wires/yarns, your approach may be even more valid. This is because metals tend to memorize shape in much greater degree than fabric yarns, a character which can be both advantage and disadvantage. In examples shown in Fig9&10 (they are both aesthetically so nice! ), you use torchon ground stitches that hold stiches pretty well, and the difference in the length of threads for different directions will perhaps help to hold the shape more or less permanently? Do they remain more or less in the same shape, when you give a light pull to the woven lace? 5) I wish to see more examples like your Fig9 or 10! Are you able to make a database of this – something like the published ground collections by U. Lohr? Why did you omit the node immediately below in a 45 degree grid (Basic)? Why 7 and 11 outgoing choices instead of 6 and 10? Kortelahti, a Finnish bobbin lace designer, has invented some new grounds, back in the 1980s. You might also look at Ute Ulrich GRUENDE MIT SYSTEM. Also Ulrike Voelcker VIELS GUTE GRUENDE (4 volumes). One book of grounds, from the English perspective, isn't enough. You might look at what Brenda Paternoster has done by using graphics software to stretch and distort a pattern to make an oval, or a rectangle with rounded corners. New grounds could be an interesting addition, but bobbin lace design isn't about grounds. It is about the juxtaposition of dense areas with transparent areas, and areas of different degrees of transparency. If a designer uses the "part lace" method of bobbin lace making, then it would be easy to make a dense outline in cloth stitch tape, and fill the open space with one of your new grounds. But if you are thinking of a straight lace, like torchon or Binche, then the problem is "will the lacemaker understand how to connect my new ground to the dense clothwork of the design"? If what I just said is gibberish to you, I have a page on my personal website where I explain what "straight lace" and "part lace" mean. Now I'm going to look at your material, and I'll come back later with more comments. I'd like to hear what our other members think about this. In this diagram the red circled intersections are not as stable as they should be. The problem is that the pair coming from above right and departing towards below right has nothing adequate to keep it in that position. It will tend to move towards the right, on a path similar to the green line. Having that pair depart straight down would be a better solution. So, for instance, honeycomb ground and Paris ground (kat stitch) would use the straight down solution. There is a reason that bobbin lace makers use the set of grounds that we use. But I would be interested to see you incorporate your grounds into a piece of lace. Test them out, see how they work in practical terms. There is not need to have your discussion in 2 places, so I deleted the other one. I have included below the pair traversal pattern and the worked example with a red circle around one of these "weaker" points. In general what I found when working these examples is that the "holes" contribute much more to the overall appearance of the lace than the paths of the threads themselves - this however could be primarily because I was using a simple set of actions that are quite rigid and don't have as much movement as say a "cross, twist, pin" set of actions. I think that the straight down solution you propose would tend to flatten the right side of the large opening and enlarge the two tear drop shaped openings to the left of the large opening. This is probably also a nice arrangement but different. I am just guessing on what affect this would have, I would have to work it and see. Lorelei: "There is a reason that bobbin lace makers use the set of grounds that we use." I am greatly in awe of the beauty and diversity of stitches that are available in Bobbin Lace. 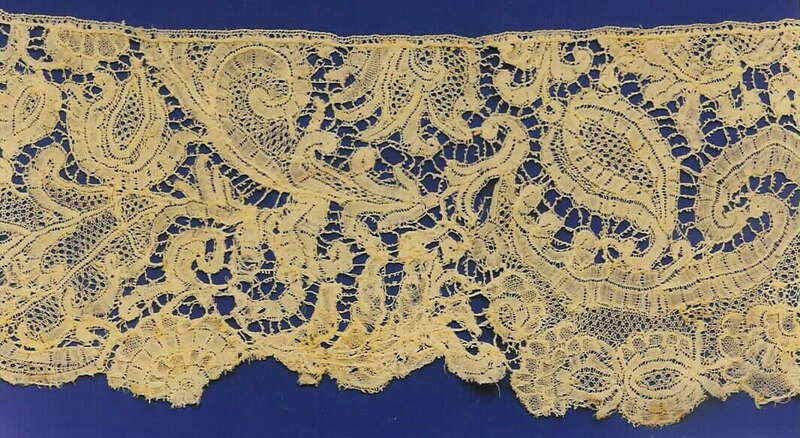 Even more so, I am hugely impressed by what it must have been like at the outset of this art form when lace makers were experimenting and discovering what works and what does not. One of my main motivators for having a look at what makes a workable, attractive Bobbin Lace stitch is the work on origami by people like Robert Lang. I f you haven't seen his TED talk, I encourage you to have a look: (http://www.ted.com/talks/robert_lang_folds_way_new_origami.html). In recent years the ancient art of origami has been extended in ways unimagined for hundreds of years and has found a huge renewed interest form scientists and artists. The main key to this revolution was a careful examination of how the previous art worked, developing a mathematical description of it and then seeing how that Math could be used to extend the art in new directions. I would like to understand better why the grounds that are used today work so well and see if, out of the millions of other possible grounds that exist, there are a few that would meet the same criteria and might be quite interesting. I have many gaps in my understanding and I welcome your comments as a way to improve my understanding. I have worked several of the traversal patterns I discovered but just as rectangular swatches. I am planning to use these traversal patterns in a lace piece which I can hopefully find time to do over the winter (now that the garden has been put to rest). 2) My representation of the traversal pattern as a directed graph is intended more as a general mathematical description than as a pattern for people to use to make the lace. I agree, this abstraction is a bit confusing because to a lace maker it looks like a pricking pattern. In order to make it into a pricking pattern, you would need to take each dot (node) and turn it into the actions that are performed on the four threads when they come together. Since this could be a tally or a braid or some simple ground stitch, the actual size, position and shape of the result may be quite different from the circle I have drawn. 3) I will have a closer look at Binche and see how the variation in grid angle and spacing affects the traversal patterns. Thank you for the suggestion. In my paper, I am more concerned with the topology (the relationship between groups of actions) than the actual geometry (the physical placement of actions in space) of how pairs traverse across a piece of lace. In that way, I hope that the idea will still generalize to Binche and other forms of lace. However, if the number of neighbouring pairs is significantly different, this could have a big impact on the result. 4) The example swatches that I have worked held up very well - the mathematician and artists I showed them to were quite interested in pulling and twisting them and the pieces suffered no ill effects. I would like to make the pieces with a much less rigid set of actions, both to see if they can hold together and also because I am interested in what affect the various different sets of actions would produce using the same traversal pattern. One of the artists who was most interested in my work creates sculptures with wire. He had not heard of Bobbin Lace before and found the results quite interesting. I am interested in seeing your work and his. 5) Since there are hundreds of thousands of these patterns, I think I will spend a little more time working on the approach before I commit to making example swatches of them all :-) I am thinking about how I can generate patterns with only a certain kind of symmetry or with a certain shape of hole. Another approach is to try and identify some heuristics by showing samples to people and asking them to identify the one they prefer. I would also really like to develop a physics based drawing model that accounts for the tension on threads so that I can render an accurate computer image of what the pattern would look like when made. Akiko: Why did you omit the node immediately below in a 45 degree grid (Basic)? The "Basic" family of patterns probably makes more sense when viewed on a hexagonal grid - in this case, the distance between a node and the one immediately below it is almost twice as far as the distance to its other neighbours. I have updated the images in the link to use a hexagonal grid. But that is not really an answer to your question. Because there are so many ways a pair of threads can move from one point to another, I started by creating simple "families" in which the number of allowed actions was severely restricted. The basic family was based on the most common kind of traversal pattern that I found in the book by Cooks and Stott. There are many other "families" to explore and I am looking at gradually increasing the number of allowed actions. Akiko: Why 7 and 11 outgoing choices instead of 6 and 10? In addition to the expected configurations with two incoming pairs, I included a configuration in which no pairs arrive at a point (and no pairs leave). This allows the patterns to have "holes" (see Figure 10 for an example with holes). Thus there are 6+1 and 10+1 configurations. 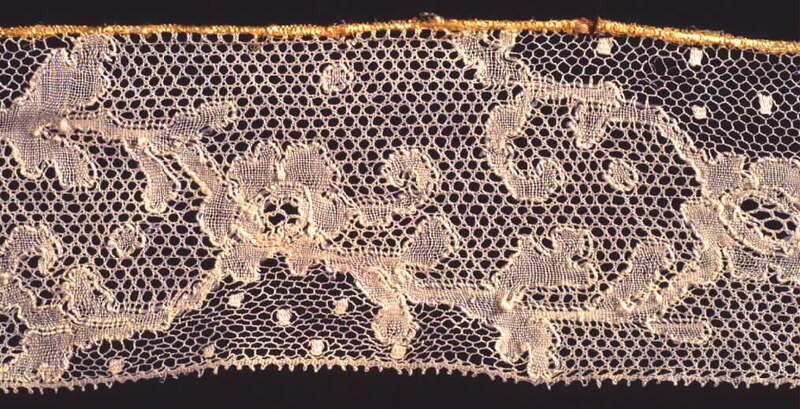 You mentionned that the holes "contribute much more to the appearance of the lace than the thread paths". All kinds of lace are really about holes. 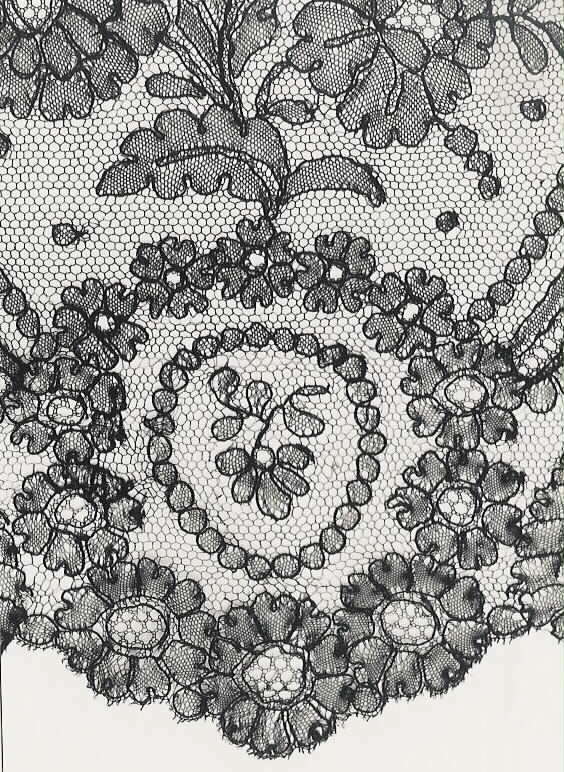 Within the last year there was a discussion on arachne about definitions for lace. The one I liked best was "lace is holes surrounded by thread". Good lace design is about juxtaposing dense areas with hole-y areas, and using hole-y areas with different kinds and shapes of holes. Thank you Veronika for your through reply, and discussions by Veronika and Ioli have been very interesting. Facing on various aspects, my brain is not very organized yet, but I’d like to rephrase here what has been around in my brain, so this text may not reach a clear conclusion after all! Basically I’m in search of a good system applicable for lace design and practical drafting. 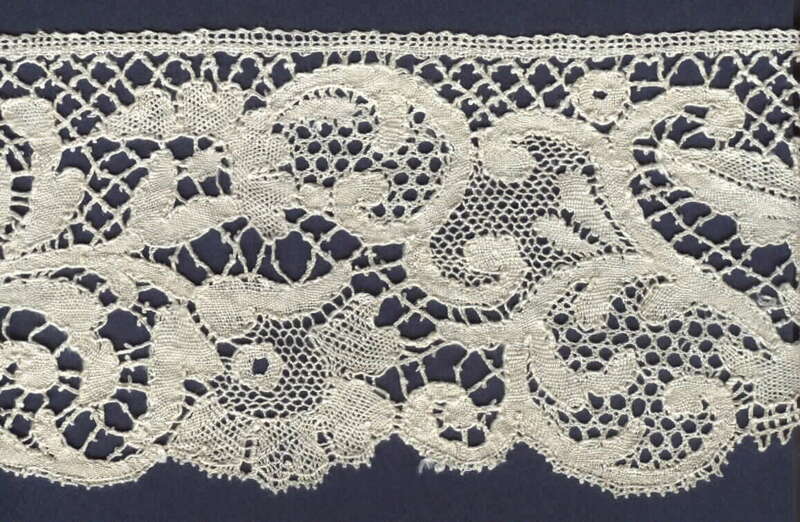 As has been pointed out, creating a nice set of contrast of density is critical in lace design. Can’t agree more. Now how to address this in practice. At least there seems like bidirectional approaches; i) You have a set of factors that affects the density of thread and manipulate them ii) You have a design base (some drawing etc.) to start with, then apply a practical system to it. An example of approach (i) may be, to start with a collection of various snowflake patterns or various grounds, etc., and choose some of them and arrange them to finally match up with your design idea. And the other example for approach (ii) may be OK I draw some mixture of organic-looking curves as a design template, then apply a directed graph and see if I can reach to a complete diagram. I guess original intention of Veronika’s paper fits in a way somewhere in between, as I understand it is about a system that generates and enumerates various pair traversal patterns. The factors that affect the thread density. In fact before going to that, I feel the need of clarifying the definition of the word, “stitch”, simply for the sake of a clear logic. I don’t know if some people occasionally use it in different/overlapping meanings. Here I’d like to limit it as “a result of set of actions”. In other words, when I say a stitch in this text, it is either a half-stitch(CT) or cloth(linen)-stitch (CTC) or a double-stitch(CTCT). Well then, there are at least two big factors that affect the thread density, under the restriction of “no plus-minus of pairs used”. But the real difficulty may be that the above both factors can interact to create a new effect. So it may not be a very straightforward passage, as you have to sort out “dependent” factors in some way. You become quite conscious of important contributions by the both, for instance in the course of re-drawing a design diagram from a woven lace. I attach a picture showing a Binche lace, traces with and without color code, and the directed-graph like pattern, arranged from left to right. Sorry about the image quality is not so good, but it’s just to highlight the fact that they contain/express information of the design in different stages. A woven lace, it contains all informations, for sure. A black/white trace, follows the pair traversal pattern. So it lacks the information for the type of stitch used (though in some places addition of twists are indicated). A color-coded trace, adding the information of stitch types by an abstract coding system, red=double stitch, purple=cloth stitch, blue=plait. This contains all information to reproduce the lace, but some characters are not visible at a glance (such as directions of pairs). In this example half-stitches(green) are not included, unfortunately. A directed graph (sort of! ), well, I just made this simply out of curiousity. (The plait was too concentrated so I skipped that.) It's possible that you add color coing by filling dots in different colors, though I didn't try here. and pairs get concentrated in snowflakes or in plaits, etc. As you say, the stitch used does change the final effect considerably. This would be true also of Veronika's computer grounds. Veronika: you say you worked your sample above with cross twist pin cross twist. If you worked it ctc pin ctc I think it would look different. Akiko: back to your example above. Did you work the Binche strip? I see you have a diagram at right for working it all in whole stitch -- ctct. If you were to do that I think much of the interest in the piece would be lost. You would have a lace with a mostly similar kind of density throughout, decorated only by the paths that individual pairs take. The actual lace from the original diagram is more interesting because cloth stitch gives such a smooth flatness, as well as maximum density, and the contrast between the cloth stitch areas, the ground areas and the snowballs, gives it more variety. Perhaps you could try out your grounds using a very simple design like this. The purple areas would be cloth stitch, worked in the torchon manner. The green areas would be your grounds. You could try several. The gray areas could be some basic thing like torchon ground. Akiko: you could also use something simple like this to test the various snowflakes and grounds used in Binche. But instead of working the purple areas in the torchon manner, use the Binche method of having 2 pairs enter or depart at every pin. When you use grounds with different shapes of grid (some 2 high x 3 wide, some 2 high by 4 wide), you could distort the cloth stitch areas a little to compensate for the change. Then you would gradually gain an understanding of how to design a more complex piece, while keeping good densities in the cloth work, and even looking grounds. What makes Binche so much more difficult to design than torchon is this problem of using several grounds in the same piece which have different shapes to the grid. And also the floral design areas. Those are always more difficult to make graceful. I so admire those modern Binche designers who are managing to work with all these difficulties and make beautiful graceful designs. I can do simple stuff and geometric designs. But the more flowing organic designs are beyond me. Thanks also for a design practice idea. I have been working on a simple collage-type designs, but this also sounds like a good place to start - have to think about it well. I tried to use one ground for a simple modern lace. My basic grid was too sparse, then I twisted the pairs more times. The net became fixed and it was no problem with obtuse angles. I think these grounds may be very usable. Thanks, Veronika!! !